DNA loop extrusion is a method used to analyze how DNA is compacted into the nucleus whilst bringing regulatory elements close to protein coding genes. 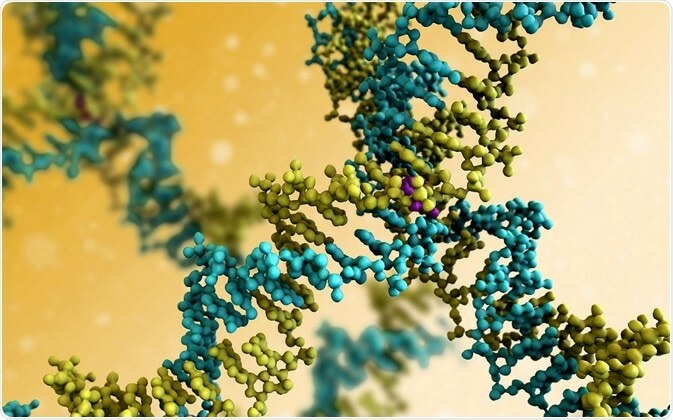 DNA, or deoxyribonucleic acid, is the genetic material used to store fundamental information in a cell. This information is extensive, with a single human cell predicted to contain about 2 meters of DNA. With the average skin cell having a diameter of 30um, the storage of DNA became a great source of interest for researchers. In addition, regulatory elements are often spread across the genome, so the challenge for scientists was working out how elements that are situated so far apart can interact to control transcription. In 2016, Fudenberg et al. proposed a hypothesis for looping. They suggested that DNA is slipped through motor proteins, which in turn forms loops of DNA. These loops have various functions, such as bringing parts of DNA closer together, keeping the fragment separated from other DNA fragments and giving a shape to the DNA. This causes the DNA to form a 3D shape, known as a chromosome; a highly compacted form of DNA found in the nucleus. It also allows genes encoded on DNA from different chromosomes to interact, thus allowing a gene to be activated by regulatory elements known as enhancers. A technique called “Hi-C” captures and sequences DNA fragments, which is then used to build a 3D map of the chromosome. This Hi-C data revealed that interactions within the chromosome only occurred within certain blocks of DNA. These are called Topologically Associated Domains (TADs) and are about 200,000 – 1 million DNA letters, or bases. A high-resolution Hi-C map developed by Rao et al., in 2014, showed that there were around 10,000 DNA loops in human DNA. Frequently, these loops contained genes and enhancers. While it is possible for fragments of DNA to interact with fragments further away, the majority of interactions occur within TADs. Fudenberg et al. suggest that loop extrusion is the mechanism behind the formation of TADs. Here, loop-extruding factors hold a region of DNA at two points, then moves along the DNA fragment. This then causes a loop of DNA to extrude from the loop-extruding factor, which continues until the loop-extruding factor comes into contact with another loop-extruding factor, or a boundary element. This ensures that loop extrusion does not progress beyond the TAD boundary. The positioning of the boundary elements can thus dictate which region of DNA are incorporated into a TAD. Therefore, boundary elements may bring a gene’s enhancer closer to the gene, so play a crucial role in switching on/off genes. Loop extruding factors and boundary elements The Fudenberg et al. study then looked for what specific proteins could be driving loop extrusion. They suggested that a protein called cohesin could act as a loop-extruding factor, and another protein called CTCF as a boundary element. In previous studies, Cohesin was shown to bind to DNA and be enriched at TAD boundaries. Interestingly, CTCF has also been shown to be enriched at TAD boundaries. This lead to the demonstration that bound CTCF interacts with cohesin. Putting this together, the study by Fudenberg et al. proposes that DNA loop extrusion occurs when loop-extruding factors (likely cohesin) bind to DNA and start moving along the DNA, which then extrudes as a loop. This stops when the loop-extruding factor encounters a boundary element, such as CTCF. Long strands of DNA are stored in a small compartment of the cell by forming loops. This process is called “DNA loop extrusion”, and involves loop-extrusion factors (likely cohesin) and boundary elements (such as CTCF). These loops form topologically associated domains (TADs), and may play a role in which genes are switched on/off by bringing gene enhancers closer to/further away from the gene.